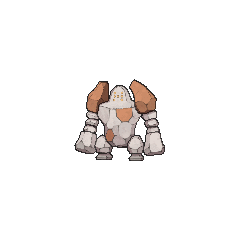 Regirock in game: 1,124 Who? Important notice! 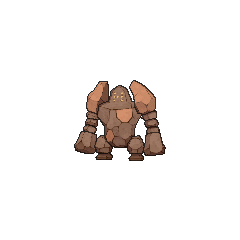 Pokemon Regirock is a fictional character of humans. Regirock made an appearance with Regice and Registeel in the eighth Pokémon movie, Lucario and the Mystery of Mew. The trio of Legendary titans were guardians of the Tree of Beginning, and attacked Ash and his friends. It was the first of the three to do this. In the end Regirock and the other members of its trio turned away and kept on with protecting the Tree of Beginning. 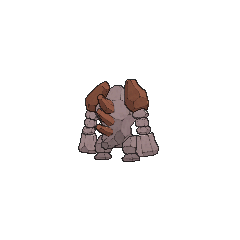 Regirock was used by Brandon in Battling the Enemy Within! He used it to battle Ash when he was being possessed by the King of Pokélantis. 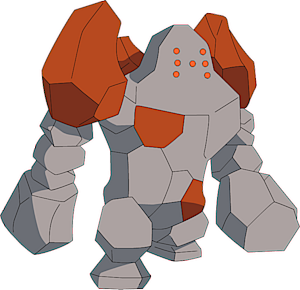 Regirock made further appearances in the Diamond & Pearl series. Regirock made a brief cameo along with the other members of its trio in the beginning of The Rise of Darkrai. Regirock debuted near the end of the Ruby & Sapphire chapter, when Sidney was attempted to open the Desert Ruins. Together, Steven and Sapphire composed a team of four Beldum and Sapphire's Relicanth and Wailord, thus opening up the chamber containing Regirock, as well as the other two titans, Registeel and Regice. Regirock used Superpower to stop Groudon and Kyogre from spreading destruction. After the battle, it and the other two titans—left weak and powerless—traveled to the mountains, where they were later caught by Brandon shortly before the opening ceremony of the Battle Frontier. Regirock, along with the other two Legendary titans, are seen under the possession of Candice. She uses them against Hareta to test his worthiness to challenge Regigigas. Regirock is tied with Regice for the highest single stat of any Legendary Pokémon with its 200-point Defense stat. Regice's is its Special Defense. Regirock has the lowest Base Special Attack stat of all Legendary Pokémon, at only 50. 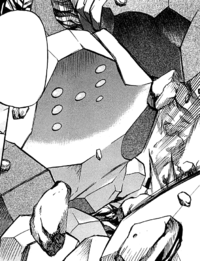 In the Pokémon Adventures manga, Regirock was the only member of the Legendary titans not to be used by a Trainer that specialized in its type. Regice was used by Glacia, an Ice-type Trainer, and Registeel was used by Steven Stone, a Steel-type Trainer, while Regirock was used by Sidney and Drake, a Dark-type Trainer and Dragon-type Trainer, respectively. 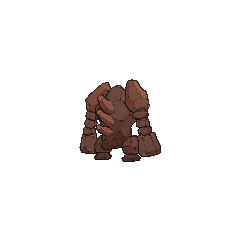 Regirock's in-game footprint resembles a scarab beetle, a real life insect that was considered sacred by ancient Egyptians, possibly alluding to Regirock's desert habitat. Scarab beetles also represent the rebirth of ancient Egypt. 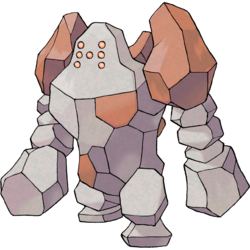 Regirock is the only Legendary titan without fingers. Regirock may be based on the golems of Hebrew legend. The legends cast them as servants of higher powers and are said to have writing on their heads. When the writing is removed, the creature would be weakened.